100% silk with little flecks of color. 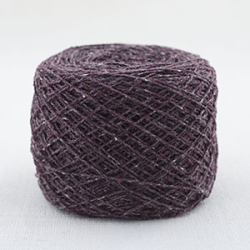 It is a very comfortable yarn and feels like cotton. Great to use by itself, strand 3 strands together or mix with another yarn. 2 cones will make a large scarf. 4 cones will make a garment or an extremely large shawl. Good as weft & warp yarn for weaving. (Labeled both N84 & A1 - it is the same yarn) Note: Tsumugi ships on a cone! Skein pictures shown are hand wound from cones!